Plush Donkey Toy 6" Size. Great Fun, Cute!!! Products feature eyes, noses, smiles, etc. that are either stitched on or embroidered to ensure product safety. Only the tiniest eyes are glued with safety tested, non-toxic glue. All of the fabrics used are ultra thick and durable. This makes them washer and dryer safe. Just wash them! Dry them! And return them to your anxiously waiting pet! Corners are not cut when it comes to making noise! Who wants a grunter or a squeaker that gives out after a few chews? Nobody! That's why only the best noisemakers are good enough for our line! Contrary to popular belief, dogs are not stimulated by just any old thing. This bright assortment of colors keeps them amused for hours at a time! A large amount of importance is placed on the slightest detail! The manufacturer feels that from the largest, to the smallest toy's faces must have joyful or curious expressions. Because even though these toys are for pets, hey want to make children smile too! 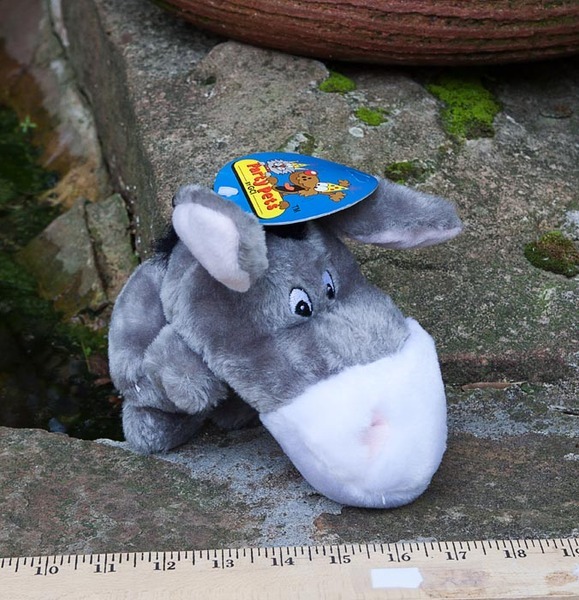 Click the button below to add the 6" Donkey Premium Plush Toy to your wish list.